Original Editor - Robyn Holton, Frank Ryan, Shawn Swartz, Elaine McDermott, Noel McLoughlin, Zeeshan Mundh as part of the Current and Emerging Roles in Physiotherapy Practice project. 6.2 The issue with "Calling it as it is"
Effective Communication Techniques in a healthcare setting has been developed on the bases that physiotherapists are in a unique position as part of a multidisciplinary team in that they can have substantially more contact time with patients than other members of the team. This means the physiotherapist is more appropriately positioned to develop a deeper patient-therapist relationship and in doing so educate and empower the patient of their physical condition and management. Communication is an important tool in a healthcare setting that when used effectively can educate, empower and de-threaten common health issues patients present with in practice. However, if it is used ineffectively it can have detrimental effects creating fear, confusion and anxiety in patients as well as encouraging resistance to lifestyle changes and healthy behaviours. It can be overwhelming for newly qualified or student physiotherapists as they must deal with such a broad range of conditions as well as differences in patient personalities, beliefs and motivation. This resource pack uses specific physical conditions as examples, however the communication strategies can be adapted and applied effectively across the broad range of physical conditions dealt with by physiotherapists. This resource tool is in no way comprehensive and does not aim to cover every physical and mental condition dealt with by physiotherapists. For this reason, this tool is limited to communication around physical conditions and does not include information on communicating with mental issues or learning problems. It is a guide with suggested examples which can be adapted and applied to different situations with regards explaining and treating physical conditions. Included are further readings recommended to encourage the reader to actively engage with and consolidate their learning. Readers are encouraged to reflect on their communication with patients and learn from their experiences to further improve practice. Understand the importance of effective communication and identify pathways which communication may be influenced. Analyse the prevailing language/metaphors that exist within healthcare and assess their impact on the bio-psyco-social model of pain. Understand how assessment and explanation of disorders/pain needs to vary for different patients and select an appropriate communication technique with which to carry this out. Identify effective communication methods that may be helpful when explaining a diagnosis/treatment to a patient. These can be modified to meet the patients preferences and needs. 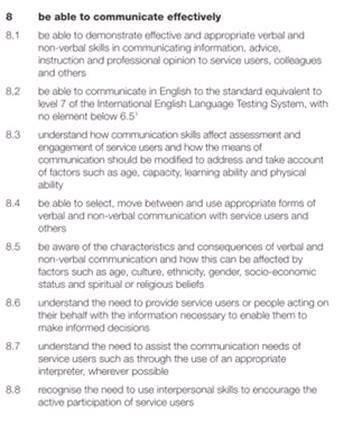 Figure 2: HCPC standards of proficiency (2013). Figure 1: CSP quality assurance standards (2012). Skilled and appropriate communication is the foundation of effective practice and is a key professional competence (See CSP: quality assurance standards and HCPC: Standards of Proficiency figure 2, above) which is highly valued by physiotherapy recipients. Effective communication requires consideration of the context, the nature of the information to be communicated and engagement with technology, particularly the effective and efficient use of Information and Communication Technology. Numerous studies have confirmed the importance of communication between physiotherapist and patient and interventions to enhance practice - some of which will be discussed throughout this learning resource. 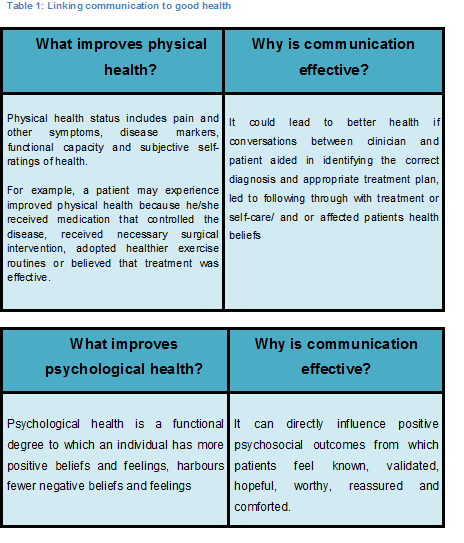 To understand why communication may lead to better improved health outcomes researchers have identified pathways through which communication influences health and well being and can be simplified in figure 3 as proposed by Street. Talk may be therapeutic, meaning, a physiotherapist who validates the patients perspective or expresses empathy may help a patient experience improved psychological well being. Leading to the patient experiencing fewer negative emotions (e.g. fear and anxiety) and more positive ones (e.g., hope, optimism and self-worth). This could affect health or that could contribute to the intermediate outcomes (e.g., adherence, self-management skills, social support that lead to better health. A physiotherapists clear explanation and expression of support could lead to greater patient trust and understanding of treatment options. This in turn may facilitate patient adherence to recommended therapy, which in turn improves the particular health outcome. Increased patient participation in the consultation could help the physiotherapist better understand the patient’s needs and preferences as well as discover possible misconceptions the patient may have about treatment options. The physiotherapist can then have the opportunity to communicate risk information in a way that the patient understands. This could lead to mutually agreed upon, higher quality decisions that best match the patients circumstances. An article by Street et al. explores these pathways to further broaden your knowledge. A link to this article can be found in ‘Further Reading’ section below. Street, R.L., Makoul, G., Arora, N.K. and Epstein, R.M. (2009). How does communication heal? Pathways linking clinicial-patient communication to health outcomes. Patient and Education Counselling, 74, pp. 295-301. Parry, R.H. and Brown, K. (2009). Teaching and learning communication skills in physiotherapy: What is done and how should it be done? Physiotherapy, 95, pp. 294-301. The Macey Model of Doctor-patient Communication is a communication skills model that illustrates fundamental processes applicable to every meeting between physician and patient, and represents a complete set of core skills (see fig. 3.4). Although this tool was developed for doctors, the model provides an overall framework for systematically teaching vital communication elements. 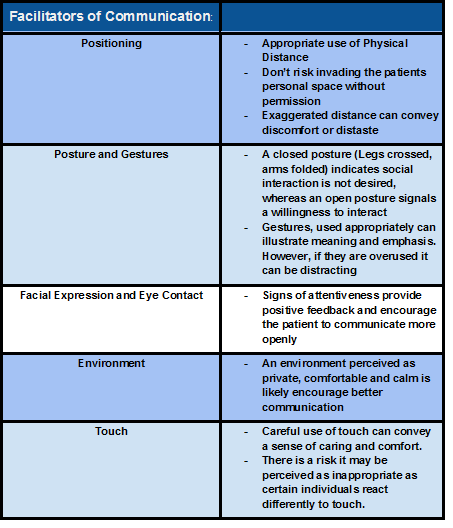 Table 1 below briefly describes how communication may influence the physical and psychological health of the patient. Miscommunication between patients and physiotherapists is often documented when it comes to diagnosis explanation and treatment advice   . Patients will describe symptoms in “lay” terms while physiotherapists often return feedback based on biomedical symptoms and processes of the condition using medical terms without taking into account the gap in the level of knowledge on the subject between the patient and themselves . Research believes that this may be because physiotherapist’s often forget to take into account the difference in literacy levels between themselves and their patient, or they don’t know how to describe a condition outside of the medical model they have been taught during training. .
Studies show that literacy levels in some countries can be as low as age 10 . According to the Organisation for Economic Co-operation and Development, the UK is now ranked 22nd in a study of 24 EU countries in terms of literacy with a national literacy age of 10 years old. In addition to this English is not everyone’s first language. According to the 2011 UK census 92% of residents acknowledged English as their first language and of the 8% remaining (3.3 million people), only 79% claimed they could speak English well or very well . Both of these factors may cause difficulty and confusion when trying to speak to a patient about their diagnosis and to make an informed decision around treatment options. By getting a better understanding of patient’s learning styles and acknowledging the difference between lay and medical terminology, we can provide effective education which, in return, may increase the compliance and cooperation of patients. Patient behaviour is determined by several factors such as family and work commitments . Patients will often weigh up these factors and consider various options before settling on the choice most suitable to their personality and lifestyle . For instructional preference. 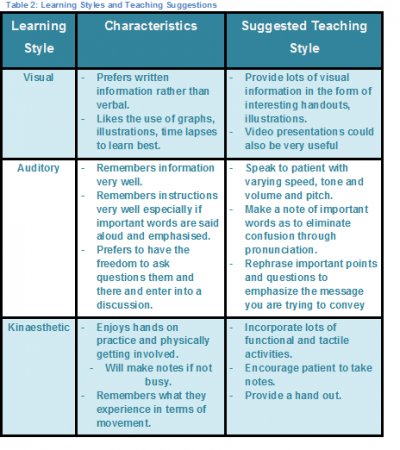 Patterson (2003) proposed three types of learning styles: Visual, Auditory & Kinesthetic as detailed in table 2 below. The most common learning theory model in application is Kolb’s four stages of experiential model (1984), which, as the names suggest is based around four stages. The ideology is that individual’s transition from phase to phase in their learning process . However, very little research is available on the application of teaching models to a healthcare setting perspective. Reflection on experience: The patient will go away and review and reflect on the experience and their understanding of their diagnosis. Abstract conceptualisation: The patient learns from the experience of their treatment and diagnosis. Experimental experience: The patient will plan and adapt to the arising situation and try out what has been learned in terms of education and treatment. Figure 4:Kolb’s four stages of experiential model. An important feature of effective communication is the ability of the patients to retain the information that is imparted. Extensive research has been conducted within health care on factors which may hinder or facilitate memory and therefore, the degree of adherence. 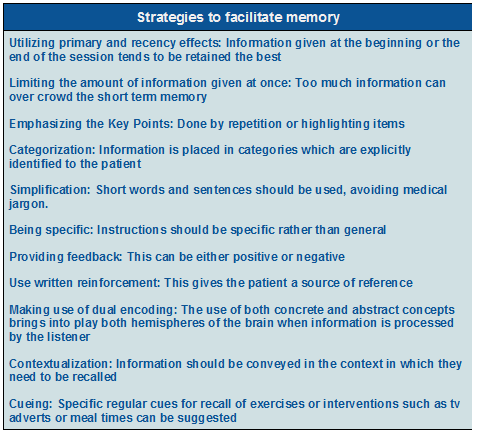 The following table summarizes some techniques which can help maximise the information patients retain and recall. However, it is important to stress that these techniques should not be seen as a substitute for interpersonal skills and attitude that helps to create a good relationship with the patient, as this is a prerequisite for good communication. The ethos of a physiotherapist defines what good occupational practices should be . General principles cover an evaluation of an adequate attitude i.e. respectable coexistence and behaviour with respect to others, as well as normal social relationships and a positive attitude towards oneself and the surrounding world. A physiotherapist should possess skills of empathetic understanding of patient circumstances and how to respect patients feelings and sensations. Kindness, engagement in the recognition of a patient's individual life situation, as well as his/her personality traits, allow the physiotherapist the ‘maximisation’ of their techniques of providing assistance to a patient. Bad news in the healthcare context can refer to any information that creates a negative view of a person’s health. Communicating bad news can be mishandled with potentially distressing results for clinicians and especially patients. Yet few health care professionals have received formal training in this area and it is evident that many feel ill prepared to perform the task of communicating bad news effectively. Dealing with difficult situations is challenging and requires important communication skills on behalf of the physiotherapist. Besides the moral, ethical and social obligations of conveying this type of information in a sensitive and accurate manner, it can also be medico-legal responsibility. Poorly communicated diagnosis can generate feelings of mistrust, anger, fear and blame. A physiotherapist’s ability to effectively communicate is typically learned through trial and error or observation of more senior staff. “The medical profession has for a long time largely neglected the influence that language itself has in shaping and conceptualising medical practice”. We know that each and every patient that is seen comes with a very individual set of life experiences and different ways of shaping understanding of their “impairments". Language and more specifically metaphors can aid in this process to promote advancement of a more meaningful understanding of diagnoses, avoidance of persistent pain, and self management strategies. 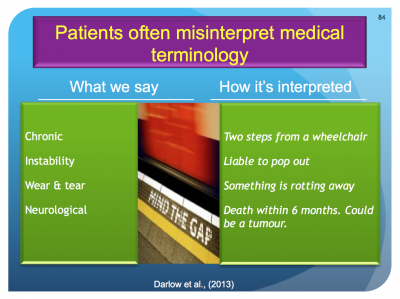 Despite these potential benefits, physiotherapists need to be aware of the chance of misinterpretations some patients might take from these metaphors. In clinical practice physiotherapists must keep treatment "patient centered" and address the unique needs of each individual patient. Due to the often complex idiosyncratic nature of bio-psycho-social pain, physiotherapists often use metaphors to try and create an “unique” reconceptualisation of what is really going on with the patients body. Now if we integrate pain for example into this situation we can argue that pain is essentially an interpretation by that individual, it can be said that the only way to adequately understand pain is through metaphor itself. Ideally a set of metaphors that address the neurobiological contexts as well as the sociocultural contexts of their lives without looking at them dualistically but instead cohesively. Over the years the use of metaphors have been looked at by many different research papers and some that are continually being used in practice produce poor patient outcomes. Below we will look at a few of the common metaphors being used across healthcare and analyse how they may benefit or be harmful to the patient. This often implies that the patients are handing over their bodies to a health professional to locate the damage and administer treatment to repair the damage. Much like a car garage. Encourages us to think in a dualistic way (BIOMEDICAL VS. BIO-PSYCHO-SOCIAL) , although if we recognise that social interaction, self interpretation and meaning are important; we must look for more adequate metaphors. Can imply that the patients are being passive and the doctors are warriors. Allows patients and clinicians to think that the patient has failed rather than the treatment. These metaphors can also lead some clinicians to think of themselves as a poor “soldier” and decrease confidence. Military metaphors can direct pain reconceptualisation away from bio-psycho-social evidence and think the war can be won with biomedical means of treatment. Some other metaphors paint a more adequate picture for patients and have been successful in practice, especially for patients with consistent pain. Journey metaphors rightfully shift the focus away from failure or success and focus on personalised adaptive exploration . Its important that we as clinicians understand and appreciate both the power and subtlety that language can possess . The debate shouldn’t be looking at what metaphor is the truest in all senses, this is irrelevant because metaphors aren’t true or false they are useful or not in various contexts..
We know from nursing literature that pain is the most common reason for an individual to seek medical advice . At times Healthcare Professionals can negatively impact patients beliefs about pain. It is common that some patients feel that their stories haven’t been listened to and consequently their pain is not validated . Many believe pain is a simple sensation that you get after, lets say “closing the car door on your finger”. It’s easy to understand in a structural model of reasoning, which believes that the more pain you get the more tissue damage you are causing. 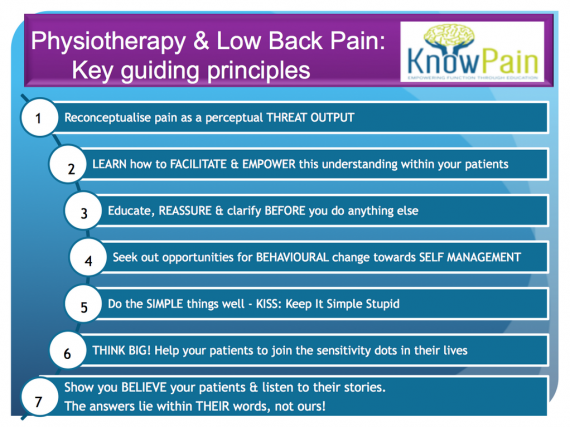 Although it is not as simple as this, and much of the persistent pain that physiotherapists see on a everyday basis would not be adequately addressed by this model of thinking. Recent authors have indicated that pain could be a measure of potential threat rather than an indication of tissue health. After the brain scrutinises all these unconscious pieces of information it asks itself, “How dangerous is this really?” Pain is a good thing and tries to protect our tissues, we as physiotherapists need to monitor if pain is adaptive or maladaptive . As pain carries on the patient may become more anxious, stressed, helpless, sedentary, further reinforcing the brain’s choice to cause pain.,We often see a fire alarm that goes off from a piece of burning toast similarly our bodies alarm system can malfunction in much the same way if the body becomes hypersensitive..
More and more research is starting to look at pain as a disorder rather than a symptom. Just as asthma, diabetes or epileptic patients are educated on the mechanisms of their disease and how their actions could make their condition better or worse. Persistent pain patients should be socratically introduced to their condition by facilitating dialogical critical thinking in a similar manner . Often it can be easier to address peoples lack of care for their pain when patients have co-morbidities because physiotherapists are able to compare how poorly their pain is being managed. If we take a moment to look at Diabetes and persistent pain through the same lense, and imagine that doctors had a patient coming in every 3 days for an insulin injection and an overnight stay because they weren't managing their diabetes correctly there would be a problem. In a physiotherapy setting if a patient was coming into your clinic every 3 days for some manual therapy to decrease their pain while they otherwise poorly manage their condition, this would not be right. Some therapists are content with that, We shouldn’t be…! According to Louw et al. (2011) Neuroscience education is a cognitive based intervention that aims at reducing pain and maladaptive behaviours by guiding patients to grasp understanding of the mechanisms underpinning their pain experience. This semi complex information needs to be delivered to the patient in a way that is clear and easy to understand. Language and other communication techniques such as drawings,pictures, videos, workbooks can aid patient learning. Research shows that traditionally clinicians tend to underestimate patients ability to understand complex pain, when in fact patients are very interested in learning about their pain . When explaining a condition such as osteoarthritis to a patient we must consider what their viewpoint of the condition must be. Osteoarthritis is a condition of cartilage degeneration, subchondral bone stiffening and active new bone formation. Osteoarthritis is a complex sensory and emotional experience. An individual’s psychological characteristics and immediate psychological contest in which pain is experienced both influence their perception of pain. Research has utilised qualitative methods and focus groups to establish the patient’s point of view. A common theme that is emerging is that patients are sometimes dissatisfied with the overall level of understanding, help and information that is given to them by healthcare professionals. Patients also expressed concern that there was a lack of understanding by healthcare professionals as to the impact that osteoarthritis can have on an individual’s life. As physiotherapists, we must be aware of current and alternative treatments for OA (hydrotherapy, acupuncture etc) as contradictory information being given to the patient from different sources may lead to confusion as to what exactly they should be doing. Somers et alhighlights that patients may adopt certain attitudes towards pain; Patients who are pain catastrophizing tend to focus on and magnify their pain sensations. This group of patients tend to feel helpless in the face of pain. Patients who adopt this stance report higher levels of pain, have higher levels of psychological and physical disability. The second stance is patients who have pain related fear. They have a fear of physical activity as a result of feeling vulnerable to pain during activity. This group are more likely to engage in avoidance behaviours such as avoiding movement. As physiotherapists we must be careful with our choice of words, phrases such as ‘wear and tear’ may be misinterpreted by some patients and lead to further maladaptive behaviour. Grime et alestablished that an ongoing concern of musculoskeletal professionals is that the use of this ‘wear and tear’ explanation often leads to decreased physical activity to avoid further ‘wearing of the joint’. A unique approach adopted by a number of patients in the same study by Grime et alwas the ‘use it or lose it’ approach. This simply put was use the joint or lose your functional ability. As physiotherapists we could utilise a similar approach to get our patients to comply with the physical exercise that we have prescribed as an intervention. Through effective communication we can increase a patient’s self efficacy and reduce their level of physical disability. Patients with higher self efficacy for pain control had higher thresholds for pain stimuli. Can we as physiotherapists use this to our advantage to increase patient’s compliance to exercise? Exercise has been shown to have a positive effect on functional ability in patients with OA. We as physiotherapists must consider the role of pain related fear in patients with OA and investigate different treatment approaches to combat this behaviour. Scopaz et alsuggests psychological factors such as anxiety, fear and depression may also be related to physical function in patients with OA of the knee. This model indicates that anxiety + fear avoidance beliefs are significant predictors of self report physical function in patients with knee OA. Following on from this, we may also consider the avoidance model presented by Dekker et al(right). This model indicates that a decreased muscle strength as a result of activity avoidance leads to activity limitations. Table 7 highlights some useful techniques when managing patients with OA. Further reading on the importance of appropriate and effective communication in the treatment of OA can be found in this article by Rosemann et al (2006). Leeuw et al (2007) paper highlighting further information about pain catastrophizing and activity avoidance. Primary care providers and particularly physiotherapists are being encouraged to provide a more active approach in the management of obesity. However physiotherapists have encountered many challenges related to addressing obesity with patients. Given that obesity is becoming an epidemic in many nations throughout the world, the need to understand how, when and with whom to have these discussions which becomes essential in order to provide effective care for obese patients. There is a growing need for the training of physiotherapists in areas such as weight loss counseling in order to reduce the barriers encountered when discussing obesity . Wadden & Didie reported that patients observed the terms obesity and fatness to be very undesirable descriptors used by their physicians when discussing their body weight. Other terms such as large size, heaviness and excess fat were also highlighted as undesirable. The use of these terms by physicians can be interpreted as offensive or hurtful by the patient and lead to a breakdown in communication. The study reported that weight was the most favourably rated term to be used by physicians as it is easily understood and non judgemental. Another term which was viewed as favourably, as it was non judgemental was BMI, however it is found to be not universally known. Johnson reported that some patients preferred to be described as plus sized, large or even fat. By embracing these terms these patients are motivated to remove the negativity and stigma related to them. Wadden and Didie reported the most beneficial approach would be to ask the patient how they feel and their thoughts towards their weight. Using this approach the physiotherapist should seek the patients consent and come to an agreement to address and discuss the issue. Caution should be taken to avoid reiterating the hazards obesity has to the patients health. Wadden et al, reported obese patients often experience a feeling that care providers seldom understand how much they suffer with their weight issues. Utilising the conversation approach also allows the physiotherapist to show respect and empathy to the patient by focusing on the positive steps they may have taken previously to tackle the issue. The issue with "Calling it as it is"
This approach fails to avoid the degrading and offensive terms, used by the public, and causes more negative effects than beneficial effects . It is a challenge for obese individuals to understand the medical implication of these terms as they cannot separate them from the degrading aspects of the terms used by the public.Using a confrontational approach instead of a discussion with the patient is far more likely to negatively affect the patient’s moral, feelings and confidence. Johnson reports that care providers who approach the issue by attempting to 'break through the patient’s denial of their weight issues, are more likely abolishing the patients trust and their motivation to return for future sessions and care. This is the most common outcome when individuals are advised to battle their obesity by losing weight, to avoid the ominous medical consequences. More desirable and beneficial outcomes can be achieved through the use of motivational interviewing and discussions with patients in need of weight management compared to a confrontational approach . Tools such as the video below can be used in teaching and motivating patients on lifestyle and behaviour change. Evidence has shown that patient-centred approaches to health care consultations are more effective than the traditional advice giving, especially when lifestyle and behaviour change are part of the treatment. In the past, healthcare practitioners encouraged patients to change their lifestyle habits through provision of direct advice about behaviour change. However, this has proven to be unsuccessful, as evidence show success rates of only 5-10% . Additionally, this can put a strain on the patient-therapist relationship with the patient perceiving this style as being lectured on their lifestyle choices. Patients can also feel that the therapist is not considering the personal implications the change may have on their life, as they are just placing emphasis on the future benefits and not recognising the initial struggle the patient may have to go through. Such an encounter can risk the patient becoming resistant to change or further increasing their resistance to change. This resistance to change was seen as a personality trait that could only be dealt with by direct confrontation which potentially placed a further strain on the patient-therapist relationship . Research has shown that patient-centred approaches have better outcomes in terms of patient involvement and compliance . The key feature to these approaches is that the patient actively engages in discussing a solution for their problem. 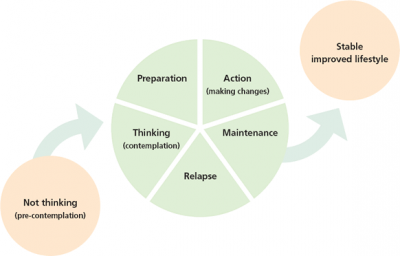 Motivational Interviewing (MI) is based off Miller & Rollnick’s (1991) experience with treatment for problem drinkers and is becoming increasingly popular in healthcare settings. The model views motivation as a state of readiness to change rather than a personality trait. As such, motivation can fluctuate over time and between situations. It can also be encouraged to go in a particular direction. By taking this view , a patient’s resistance to change is no longer seen as a trait of the person but rather something that is open to change. Therefore, the main focus of MI is to facilitate behaviour change by helping the patient explore and resolve their ambivalence to the change. While MI is patient centred and focuses on what the patient wants, thinks and feels, it differs slightly from other patient-centred approaches as it is directive. In using MI there is the clear goal of exploring the patient’s resistance to change in such a way that the patient is likely to change their behaviour in the desired direction. - assist the patient in examining their expectations about the consequences of engaging in their behaviour. - Influence their perceptions of their personal control over the behaviour through use of specific techniques and skills. A benefit to this approach is that time can be saved by avoiding unproductive discussion by using rapid engagement to focus on the changes that make a difference. MI has been linked to the transtheoretical model of change, with the model providing the framework with which to understand the change process and MI providing the means of facilitating that change. The principles of MI are closely related to those of cognitive dissonance. MI focuses on resolving ambivalence by focusing on inconsistencies . This is creating dissonance. Techniques used in MI, such as reflection and summarizing, function to develop cognitive dissonance. It produces as dissonant state by focusing on the ambivalence and then controls the direction chosen for the dissonance resolution through skilful and practiced use if the MI techniques. An empathetic conversational style is fundamental. The PT's attitude must be one of acceptance and they must view resistance to change as normal. Using this empathetic style the PT can create and amplify any discrepancy between the patients present behaviour and their goals in such a way that the patient can present an argument for change. Argumentation between the patient and PT should be avoided as it is counterproductive and only serves to increase resistance to change and damage the patient PT relationship. The consultation is carried out in a facilitative way where the relationship between the PT and patient is seen more as a partnership instead of an expert/client. The patient is viewed as a valuable resource to finding a solution to their problem and they are responsible for choosing and carrying out personal change . In order for this to be effective the patient must have a belief in themselves and their ability to change . As such, the PT must encourage, support and build self efficacy . There is one key distinction between Motivational Interviewing and other patient centred approaches. 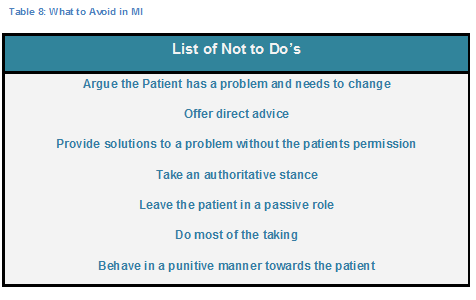 MI is not viewed as a technique which is applied to patients, but rather an interpersonal style which is shaped by guiding principles of what triggers behaviour change processes. The spirit of adhering to the method involves allowing patients to express their own arguments to change and the PT to accept these. MI is an individually tailored client centred method which changes to suit each individual ensuring that effectiveness is increased . As such, there is no set structure to MI as a too tightly structured model will fail to honour the uniqueness of the individual, their views and their issues. However there is a range of techniques that can be used interchangeably to effectively carry out MI. 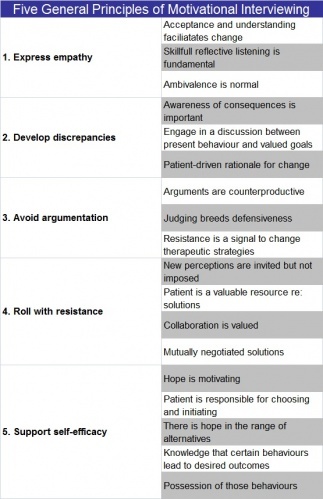 It is the patient’s task to articulate and resolve their resistance to change . It is the therapist’s task to expect and recognise resistance and to be directive in helping the patient recognise and resolve this resistance. This can be done through the use of MI specific trainable techniques. Reflective Listening statements, directive questions and strategies for eliciting internal motivation from the patient. 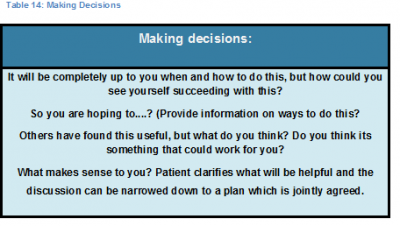 These are in the form of self motivating statements from the patient as is encourages them to examine their resistance to change and make their own decision about why and how to proceed. Strategies for ensuring client resistance are minimized. Motivational Interviewing has been modified for use in healthcare settings. This is mainly to overcome issues surrounding time constraints, as intervention effectiveness increases with contact time, yet a general first PT appointment will last 40 minutes. Models have been developed to deliver 30 minute interventions based on a framework. One such framework is Brief Motivational Interviewing (BMI). This is a set menu of techniques which follow the spirit and practice of MI. It has been designed for use in a 40 minute single session in a primary healthcare setting. A very clear distinction is made between the practitioners job, which is providing facts, and the patients role which is the personal interpretation of how those facts apply to them. This influences the decision making process by actively engaging the client in the evaluation of their lifestyle and behaviour and can potentially promote a change in the balance of positive and negative aspects to change relating to their behaviour. Traditionally the PT would be seen in the role of an expert and the advice given and the interpretation would be delivered by the PT in one message. With using MI, the patient is in the role of the expert as they must decide how the facts are interpreted and whether it is relevant to their situation. The PT uses reflective listening in seeking to further understand the patient’s point of views. Through expressing acceptance and affirming the patients freedom of choice and self determination, they can monitor and influence the patient’s readiness to change. However, care must be taken not to jump ahead of the patient or take over the decision making as this can lead to increased patient resistance. Advice must not be given without the patient’s permission and when given, it is always accompanied by encouragement to the patient to make their own choices. It is also the patient’s decision as to where to take the consultation. The PT should encourage this through use of agenda setting to help structure the discussion so that it is meaningful and important to the patient. Personal dissonance is a strategy commonly used in motivational interviewing. Its aim is to create dissonance between the patient’s positive image of themselves and their negative image of themselves . They are encouraged to outline the positives in remaining how they are, followed by the negatives. The PT should encourage them to talk about specific individualised problems and concerns they have about their own behaviour. The strategy concludes with a summary which highlights both the problems and concerns and the positive benefits as outlined by the patient. Following this the patient can be encouraged to weigh up the pros and con's of behaviour change. The PT can assist with support and influence the patient’s readiness to change through this discussion. These strategies are not used in isolation or in a set way. All techniques are used alongside each other in a way which is unique to each individual and problem . MI should not be thought of as a quick fix method or clever technique used to get patients to do something they do not want to. It is something that is done with and for them. If the patient responds positively and becomes active in the change discussion this can be viewed as positive feedback . However, resistance is a signal to change strategy. The resistance should be acknowledged by the PT and they should encourage the patient to further explore this resistance with a view to shift the patient’s perception. MI involves helping patients to say why and how they might change based on the use of a guiding style. A guiding style is used to engage patients, clarify their strengths and aspirations, evoke their own motivations for change and promote autonomy of decision making. PT's should practise a guiding rather than a direct style, develop strategies to elicit the patient’s own motivation to change and refine their listening skills and respond by encouraging the patient to participate in change talk. The PT should take the stance of an informed guide, collaborate with patients, emphasise the patients role in decision making and facilitate their self efficacy and motivation. The PT controls the structure of the consultation and provided information when requested but the patient is responsible for leading the change discussion and providing any solutions to problems. 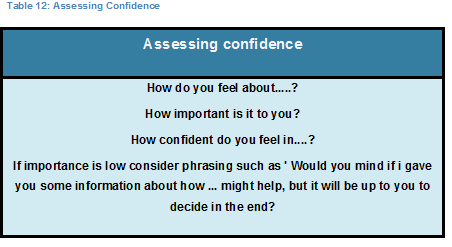 Asking- open ended questions encourage the patient to consider why and how they might change their behaviour. Listening to the patients experience- use reflective listening statements or brief summaries. This shows empathy and encourages the patient to elaborate further as well as it being the best way to respond to and understand resistance. Informing- ask permission from the patient before providing information and then discuss the patients views of the implications of the advice. 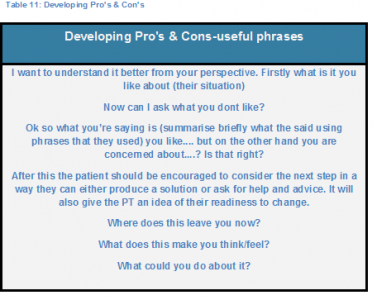 Asking the patient their views on the pro's and cons of keeping their behaviour the same can be helpful in influencing their readiness to change. The next step would be to discuss with them if change was a possibility and how they could bring it about. Miller et al (1994) have shown that the most successful way of exchanging information with the patient is by using the elicit-provide-elicit strategy. This is where the patient clarifies the personal implications of the information which is provided to them by the PT. A PT can further enhance their MI skills by paying attention to the language used by patients. Patients either use change talk about how or why they might change (I want to, I should exercise etc.). Or the opposite (I’ve never been able to lose weight etc.). The PT can chose whether to encourage the patient to use change talk or not but studies believe that readiness to change is more likely to be enhanced and the subsequent change is more likely to take place when change talk is used. Practice, training, supervision and feedback on performance will increase the PT's ability and confidence in using efficient questioning that suits both their own personality, that of their patient and the setting. The hardest challenge most PT's will face is using the guiding style and empathetic attitude as this requires the PT to ignore the tendency to identify and solve the problems for the patient. This can make PT's feel like they do not have control of the session, but they can still retain control of the direction of the session while giving the control of the what, why and how to change to the patient. The PT can still offer advice and expertise but in a way that is collaborative with the patient’s views and emphasising that the patient makes the final decision on what they will do. The videos below show a healthcare professional attempting to embark on a conversation about quitting smoking with a patient. This is a scenario very applicable to physiotherapists, especially those working in a respiratory area. The first video shows the traditional advice giving approach, while the second shows the implementation of motivational interviewing techniques. This resource tool was made as a guide for newly qualified physiotherapists and other healthcare professionals interested in improving their communication skills or expanding their knowledge of effective communication tools. It highlights the importance of good, clear, compassionate communication in a healthcare setting, as well as how communication style may differ between individual patients due to learning styles, literacy levels or the level of understanding the patient has of their condition and the anxiety they may present with. It focuses on certain techniques that physiotherapists can adapt to deal with a broad range of conditions. It offers suggestions and links to further relevant readings to enhance learning and to give the reader the opportunity to explore further relevant tools. Users are encouraged to practice these communication techniques regularly and to reflect on their own practice to best develop their communication skills and to discover what works best for them. ↑ 1.0 1.1 Quality Assurance Standards for Physiotherapy Service Delivery. (2012). Chartered Society of Physiotherapy (CSP). ↑ Standards of Proficiency - Physiotherapists. (2013). Health and Care Professions Council (HCPC). ↑ PARRY, R.H. and BROWN, K.,2009. Teaching and learning communication skills in physiotherapy: What is done and how should it be done? Physiotherapy. vol.95, pp. 294-301. ↑ 4.0 4.1 4.2 4.3 4.4 SREET, R.L., MAKOUL, G., ARORA, N.K. and EPSTEIN, R.M., 2009. How does communication heal? 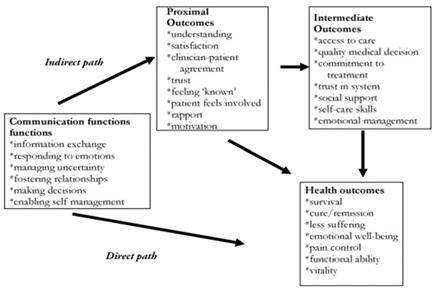 Pathways linking clinicial-patient communication to health outcomes. Patient and Education Counselling. vol. 74, pp. 295-301. ↑ HENRICSON, M., ERSSION, A, MAATTA, S., SERGESTEN, K. and BERGLUND, A.L., 2008. The outcome of tactile touch on stress perameters in intensive care: a randomized controlled trial. Complement Ther Clin Pract. vol. 14, pp. 244-254. ↑ KNOWLTON, G.E. and LARKIN, K.T., 2006. The influence of voice volume, pitch and speech rate on progressive relaxation training: application of methods from speech pathology and audiology. Applied Psychophysiology Biofeedback. vol. 31, pp.173-185. ↑ WEZE, C., LETHARD, H.L., GRANGE, J., TIPLADY, P. and STEVENS, G., 2004. Evaluation of healing by gentle touch in 35 clients with cancer. Europe Journal of Oncology Nursing. vol. 8, pp. 40-49. ↑ STEWART, M.A., 1995. Effective physician-patient communication and health outcomes: a review. Can Med Assoc J. vol. 152, pp. 1423-1233. ↑ 9.0 9.1 9.2 KALET, A., PUGNAIRE, M.P., COLE-KELLY, K., JANICIK, R., FERRARA, E., SCHWARTZ, M.D., LIPKIN, M. and LAZARE, A., 2004. 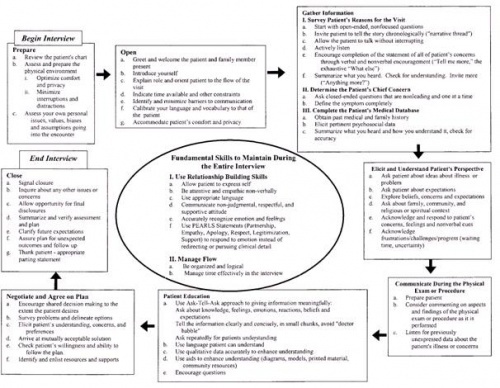 Teaching communication in clinical clerkships: Models from the macey initiative in health communications. Academic Medicine. vol. 79, no. 6, pp. 511-520. ↑ 10.0 10.1 10.2 10.3 10.4 ONG, L.M., VISSER, M.R., LAMMES, F.B. and de HAES, J.C., 2000. Doctor-patient communication and cancer patients’ quality of life and satisfaction. Patient Education Counselling. vol. 41, pp. 145-156. ↑ 12.0 12.1 12.2 DONOVAN, J. (1991). Patient education and the consultation: the importance of lay beliefs. Annals of the rheumatic diseases, vol. 50, Suppl 3, pp. 418. ↑ 17.0 17.1 17.2 STRÖMBERG, A. (2005). The crucial role of patient education in heart failure.European Journal of Heart Failure, vol. 7 issue 3, pp. 363-369. ↑ 18.0 18.1 18.2 18.3 18.4 CASSIDY, S. (2004). Learning styles: An overview of theories, models, and measures. Educational Psychology, vol. 24, issue 4, pp. 419-444. ↑ PATTERSON, D. J. (2003). Learning Styles. Journal of Adventist Education Summer, vol. 39. ↑ KOLB, D. A. (1984). 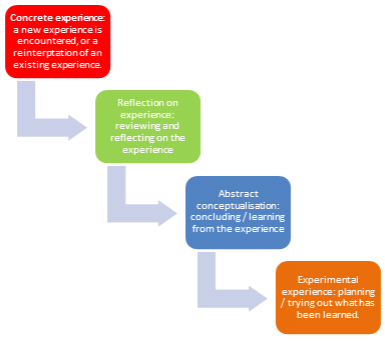 Experiential learning: Experience as the source of learning and development (Vol. 1). Englewood Cliffs, NJ: Prentice-Hall. ↑ 23.0 23.1 23.2 Standards of Proficiency - Physiotherapists. (2013). Health and Care Professions Council (HCPC). ↑ 24.0 24.1 WALSH, R.A., GIRGIS, A., and SWANSON-FISHER, R.W., 2010. Breaking bad news 2: what is available to guide clinicians?. The Journal of Behavioural Medicine. Vol 24, no. 2, pp. 61-72. ↑ 25.0 25.1 25.2 COLLETTI, .M.,D., GRUPPEN, L., BARCLAY, AND STERN, D., 2001. Teaching students to break bad news. The Amercian Journal of Surgery. Vol. 182, pp. 20-23. ↑ 26.00 26.01 26.02 26.03 26.04 26.05 26.06 26.07 26.08 26.09 26.10 26.11 26.12 Loftus, S. (2011). Pain and its Metaphors: A Dialogical Approach. J Med Humanit, 32(3), pp.213-230. ↑ Sontag, S. (1978). Illness as metaphor. Oxford. Oxford University Press. ↑ 28.0 28.1 28.2 28.3 28.4 28.5 28.6 28.7 Stewart, M. (2014). The Road To Pain Reconceptualisation: Do Metaphors Help Or Hinder The Journey?. Journal of the Physiotherapy Pain Association, Winter(36), pp.24-31. ↑ Bedell, S., Graboys, T., Bedell, E. and Lown, B. (2004). Words That Harm, Words That Heal. Archives of Internal Medicine, 164(13), p.1365. ↑ Sullivan, M. (1995). Pain in language. Pain Forum, 4(1), pp.3-14. ↑ 32.0 32.1 32.2 32.3 32.4 Louw, A., Diener, I., Butler, D. and Puentedura, E. (2011). The Effect of Neuroscience Education on Pain, Disability, Anxiety, and Stress in Chronic Musculoskeletal Pain. Archives of Physical Medicine and Rehabilitation, 92(12), pp.2041-2056. ↑ Reisfield, G. and Wilson, G. (2004). Use of Metaphor in the Discourse on Cancer. Journal of Clinical Oncology, 22(19), pp.4024-4027. ↑ Hartley, T. (2012). Cutting Edge Metaphors. Journal of the Association of Surgeons of Great Britain & Ireland, (37), pp.26-29. ↑ 35.0 35.1 35.2 Yelland, M. (2011). What do patients really want?. International Musculoskeletal Medicine, 33(1), pp.1-2. ↑ 36.0 36.1 36.2 Darlow, B., Dowell, A., Baxter, G., Mathieson, F., Perry, M. and Dean, S. (2013). The Enduring Impact of What Clinicians Say to People With Low Back Pain. The Annals of Family Medicine, 11(6), pp.527-534. ↑ Croft, P., Macfarlane, G., Papageorgiou, A., Thomas, E. and Silman, A. (1998). Outcome of low back pain in general practice: a prospective study. BMJ, 316(7141), pp.1356-1359. ↑ Butler, D. and Moseley, G. (2003). Explain pain. Adelaide: Noigroup Publications. ↑ Nair, M. and Peate, I. (2012). Fundamentals of Applied Pathophysiology. Chicester: Wiley. ↑ 40.0 40.1 Moseley, G. (2003). A pain neuromatrix approach to patients with chronic pain. Manual Therapy, 8(3), pp.130-140. ↑ Moseley, G. (2007). 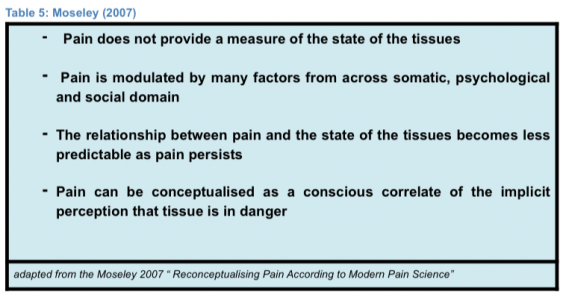 Reconceptualising pain according to modern pain science. Phys. Ther. Rev., 12(3), pp.169-178. ↑ 42.0 42.1 Gifford L (Ed) (1998) Topical Issues in Pain 1: Whiplash – science and management. Fear avoidance beliefs and behaviour. CNS Press Falmouth. ↑ Bourke, J. (2014). The story of pain. London Oxford University Press. ↑ Veinante, P., Yalcin, I. and Barrot, M. (2013). The amygdala between sensation and affect: a role in pain. J Mol Psychiatry, 1(1), p.9. ↑ 45.0 45.1 45.2 HEUTS, P.H., VLAEYEN, J.W., ROELOFS, J., DE BIE, R.A., ARETZ, K., VAN WEEL, C. and VAN SCHAYCK, O.C., 2004. Pain-related fear and daily functioning in patients with osteoarthritis. Pain. , vol. 110, no. 1, pp. 228-235. ↑ 46.0 46.1 46.2 HUNTER, D.J., MCDOUGALL, J.J. and KEEFE, F.J., 2009. The symptoms of osteoarthritis and the genesis of pain. Medical Clinics of North America. , vol. 93, no. 1, pp. 83-100. ↑ 47.0 47.1 47.2 47.3 HILL, S., DZIEDZIC, K.S. and NIO ONG, B., 2011. Patients' perceptions of the treatment and management of hand osteoarthritis: a focus group enquiry. Disability and Rehabilitation. , vol. 33, no. 19-20, pp. 1866-1872. ↑ 48.0 48.1 48.2 SOMERS, T.J., KEEFE, F.J., PELLS, J.J., DIXON, K.E., WATERS, S.J., RIORDAN, P.A., BLUMENTHAL, J.A., MCKEE, D.C., LACAILLE, L. and TUCKER, J.M., 2009. Pain catastrophizing and pain-related fear in osteoarthritis patients: relationships to pain and disability. Journal of Pain and Symptom Management. , vol. 37, no. 5, pp. 863-872. ↑ HENDRY, M., WILLIAMS, N.H., MARKLAND, D., WILKINSON, C. and MADDISON, P., 2006. Why should we exercise when our knees hurt? A qualitative study of primary care patients with osteoarthritis of the knee. Family Practice. Oct, vol. 23, no. 5, pp. 558-567. ↑ 50.0 50.1 GRIME, J., RICHARDSON, J.C. and ONG, B.N., 2010. Perceptions of joint pain and feeling well in older people who reported being healthy: a qualitative study. British Journal of General Practice. , vol. 60, no. 577, pp. 597-603. ↑ 51.0 51.1 51.2 SCOPAZ, K.A., PIVA, S.R., WISNIEWSKI, S. and FITZGERALD, G.K., 2009. Relationships of fear, anxiety, and depression with physical function in patients with knee osteoarthritis. Archives of Physical Medicine and Rehabilitation. , vol. 90, no. 11, pp. 1866-1873. ↑ DEKKER, J., TOLA, P., AUFDEMKAMPE, G. and WINCKERS, M., 1993. Negative affect, pain and disability in osteoarthritis patients: the mediating role of muscle weakness. 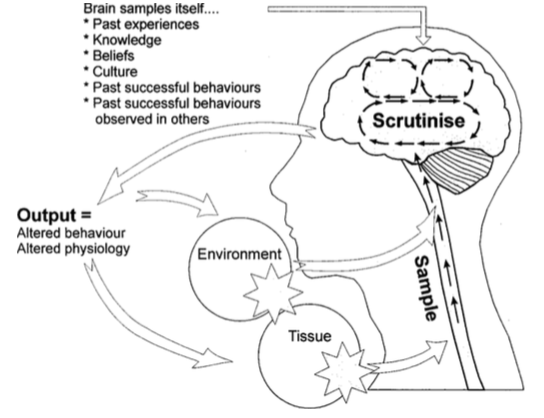 Behaviour Research and Therapy. , vol. 31, no. 2, pp. 203-206. ↑ HOLLA, J.F., VAN DER LEEDEN, M., KNOL, D.L., PETER, W.F., ROORDA, L.D., LEMS, W.F., WESSELING, J., STEULTJENS, M.P. and DEKKER, J., 2012. Avoidance of activities in early symptomatic knee osteoarthritis: results from the CHECK cohort. Annals of Behavioral Medicine. , vol. 44, no. 1, pp. 33-42. ↑ STAFFORD, R.S., FARHAT, J.H., MISRA, B. and SCHOENFELD, D.A. (2000). National patterns of physician activities related to obesity management. Archives of Family Medicine, vol 9 issue 7, pp.631-638. ↑ WADDEN, T.A. and DIDIE, E. (2003). What's in a Name? Patients' preferred terms for describing obesity. Obesity Research, vol 11 issue 9, pp.1140-1146. ↑ 57.0 57.1 57.2 JOHNSON, C. (2002). Obesity, Weight Management and Self-Esteem. In: Wadden, T.A. and Stunkard, A.J Handbook of Obesity Treatment. New York, NY: Guilford Press, pp.480-493. ↑ 58.0 58.1 WADDEN, T.A. and DIDIE, E. (2003). What's in a Name? Patients' preferred terms for describing obesity. Obesity Research, vol 11 issue 9, pp.1140-1146. ↑ WADDEN, T.A., ANDERSEN, R.A. AND FOSTER, G.D., BENNET, A., STEINBERG, C. and SARWER, D.B. (2000). Obese Women's Perceptions of Their Physicians' Weight Management Attitudes and Practices. Archives of Family Medicine, vol 9 issue 7, pp.854-860. ↑ MILLER, W.R. and ROLNICK, S. (2002). 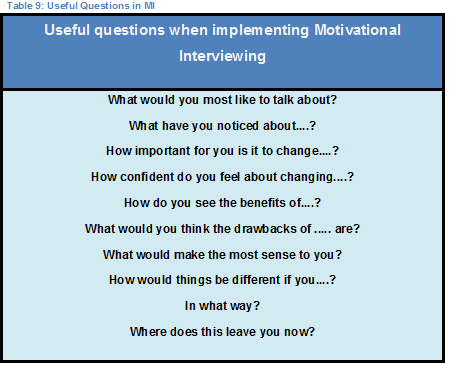 Motivational Interviewing: Preparing People for Change. New York, NY: Guilford Press.